Want to try making fudge? I know making homemade candy can seem hard but with the right recipe, it can be easy. Here’s how to make easy fudge so you can be enjoying homemade fudge in no time. If you’ve never made fudge before, you might think it’s hard to make. But it really depends on the recipe you try. Some fudge recipes you’ll need a candy thermometer. I make a few batches every year with a candy thermometer but I grew up watching my mom, grandma and aunt make candy every Christmas. Did you know you can make fudge without a candy thermometer? 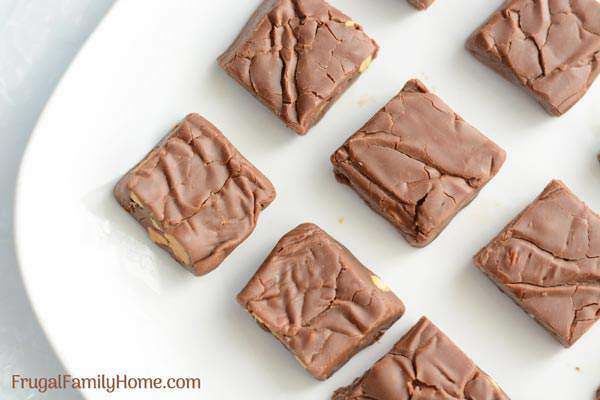 This easy fudge recipe is so simple to make. 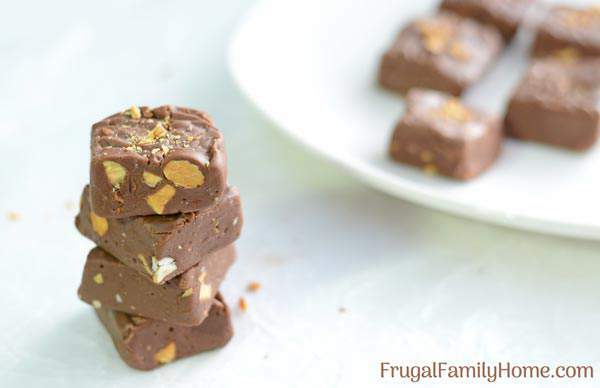 Really, I’m serious if you can stir, chop almonds and use a microwave you can make this simple milk chocolate almond fudge in about 5 minutes. Well, you’ll need to include a little setup time with that too before you dive in and indulge. But you can sample a little out of the bowl before it sets up. Yum! 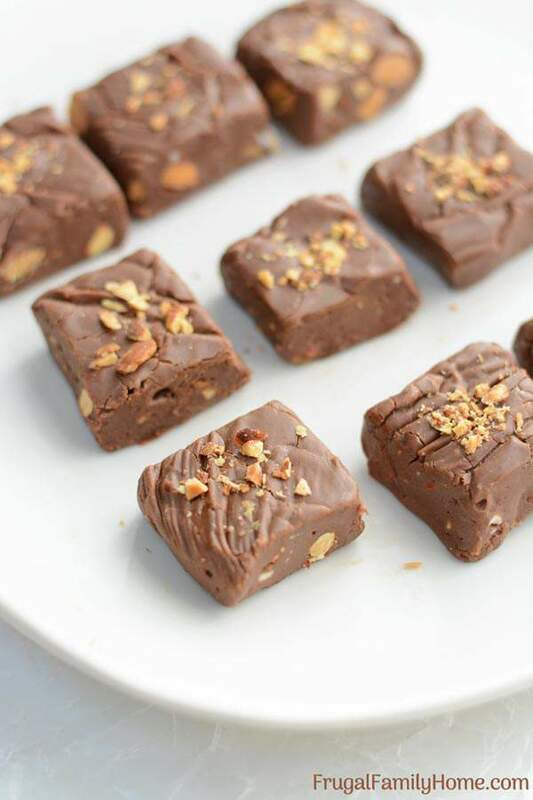 Your friends will be impressed when you bring out a yummy plate of homemade fudge. As they let the yummy soft chocolate melt in their mouths with glee, you’ll sit back and realize wow that wasn’t hard at all. 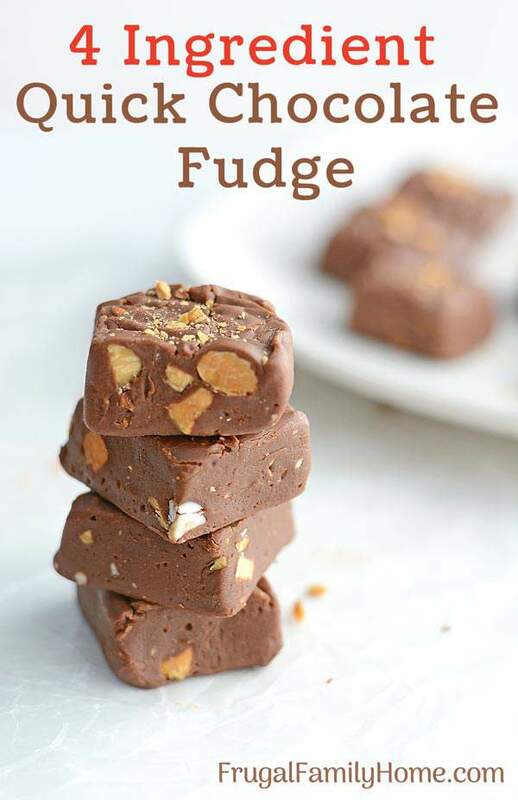 That’s right 4 ingredients, 5 minutes and soon you’ll be enjoying a soft silky bite of yummy homemade fudge you made with your own two hands. In case you’re not quite convinced it is going to really be that easy, I made a video of the recipe from start to finish. Just click the play button. 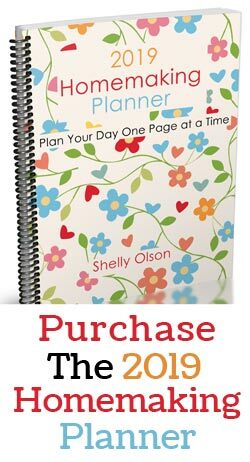 Then scroll on down to grab the printable recipe too. ~ Prep the pan before you start making the fudge. I like to grease a 9-inch square pan and then line it with wax paper. It will make it easier to cut the fudge once it’s set up. ~ Microwave the chips in one-minute intervals to soften them a bit. You don’t want to microwave them too long as they can burn even in the microwave. Yes, I was impatient once and it happened to me. Don’t be like me, run the microwave for 1 minute at a time and check. ~ After microwaving the chips about 2 minutes add the sweetened condensed milk. I like to warm the chips a bit before adding the milk. It helps to keep me from scorching the chips. ~ Stir well to get the vanilla chips really mixed in with the chocolate chips and milk. You don’t want any streaks of white. 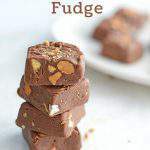 ~ Once your fudge is a creamy and smooth add the chopped almonds and quickly pour into the prepared pan. Let it set up until firm and then cut into squares. ~ Store in an airtight container. Spray a 9-inch square pan with cooking spray and then line with wax paper. In a large microwave-safe bowl add the chocolate chips and vanilla chips. Microwave at 1-minute intervals for 2 minutes. After the chips are softened stir in the sweetened condensed milk and microwave another minute and stir. Repeat until the chips are softened and can be stirred into the milk smoothly. Pour fudge mixture into the prepared pan and place in the refrigerator to chill for about an hour or until firm. 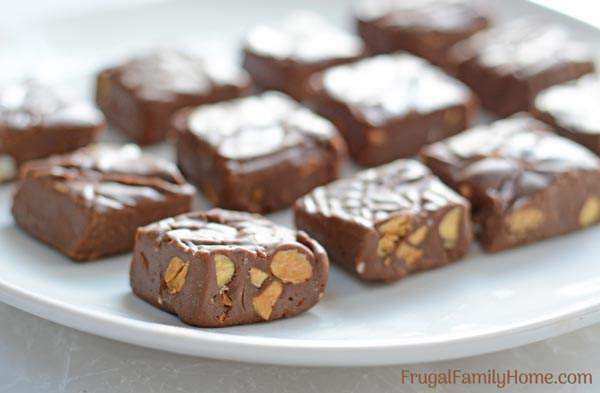 After fudge is firm, lift the fudge out of the pan with the wax paper and cut into squares. We love homemade chocolate fudge and now that you know how to make easy fudge too, I hope you’ll give it a try and share a batch or two with your family and friends. It really is a delicious yummy treat. My mom always made a big batch of fudge at Christmas time, but it involves some cooking on the stove, which can be a little tempermental. 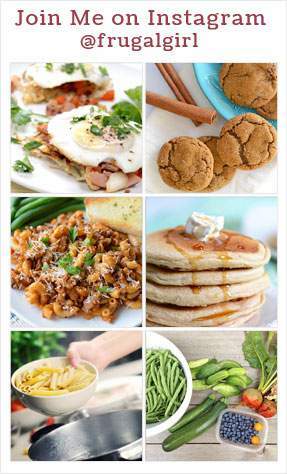 Your method looks so much easier! Erin, yes this method is easier. I make both kinds of fudge the fussy fudge and the easy fudge. Both are really good.